Recently on the Voynich Manuscript mailing list there has been a kerfuffle over a supposed Athanasius Kircher booklet find in Minerva Auctions’ catalogue. You can find the details summarised here in Ellie Velinska’s blog (don’t worry, the April Fools’ joke at the bottom is on her part, not Minerva’s). I’ll continue with what I’ve dug up. Minerva Auctions is a real auction company with real location, events (where people have the catalogues on hand) and items; you can see photographs of these. So it is not just a website like eBay stores (don’t trust those!). Their turnover in 2012 was 4.6 million Euros. They were founded in 2006 as Bloomsbury Auctions Italia, a branch of Bloomsbury Auctions. They were acquired by Dreweatts in 2011, but as part of an agreement they remained Bloomsbury Auctions Italia until 2012 when they were rebranded as Minerva Auctions. Their location and staff have remained constant throughout. Minerva Auctions has featured in numerous articles in independent sources (more links, more links, more links, more links, more links, more links, more links, more links, more links, more links, more links, and at least 30 more about l’Infinito by Leopardi). None contain any complaints or controversy. Their auctioned items have included works by Andy Warhol, Orlando Itello Griselli, Carlo Collodi, Andrea Doria (16th century, letter sold for €15,000), Benozzo Gozzoli (1452 letter, sold for €18,750), Mario Giacomelli, Pietro Donzelli, Elio Luxardo, Eda Urbani, Ghitta Carrell, Teddy Killer (what a name), Aloha Oe (the street artist), Omino71, Mr. Klevra, Biodpi, Zuk Club, Giacomo Balla, Giulio D’Anna, Renato Bertelli, Alighiero Boetti, Renato Guttuso, Franco Angeli (the artist), Mario Schifano, Merino Mazzacurati, Piero Dorazio (sold for €118,750), Mimmo Rotella (sold for €25,000), Robert Indiana (sold for €10,625), Giacomo Leopardi (independently verified), a previously undiscovered painting by Luigi Rossi (the Swiss painter; it sold for €10,625), Tazo Secchiaroli, Berengo Gardin, William Klein, Carlo Mollino, Giovanni Boccaccio (1555 century book edition, sold for €13,750), 17th century Jesuits (sold for €27,500), Carmelo Bene (sold for €6,250), Giacomo Durazzo/Prince Albert of Saxony (sold for €25,000), Giuliano de Medici (sold for €10,250), Giorgio de Chirico (sold for €112,500), Capogrossi (sold for €20,000), Carla Accardi (sold for €15,000), Luca Giordano (17th century painting), Renato Mambor, Joseph Hooks (the sculptor), Alfro Basaldella, Pier Paolo Pasolini, Renzo Vespignani and Massino Campigli – all without controversy. They claim to check items before accepting them, with international-level specialists with experience in Christies and Bloomsbury. Their customers are many, well versed in the items they procure, from around the world, and have included the mayor of Montefalco. However at no point could I find an article, review, blog post or social media post with any dissatisfaction or allegations of fraud. Nor could I find any evidence of legal troubles. Their one online review as Bloomsbury Auctions Italia has 1 out of 5 stars but the text itself has nothing negative. Digital forgery. No item exists. Item exists as modern forgery. Item exists as historical forgery. Item exists as historically genuine booklet. Forgery could be a scam, PR stunt or prank, and it could be on the part of the seller or Minerva Auctions. Some details of the image are suspicious (diagram made by Rich SantaColoma who was the first to suspect a digital forgery with evidence) but those points could have been attributed to bad digital resizing and restoration of a genuine image (David Jackson). Some say the Latin is incorrect (“Cronolandensem” for example), the printing is sloppy and the year 1669 is far too late as the printer Hermann Scheus was no longer active for Kircher (or even in general, note how his last known work was in 1653) and Marci was already dead. Also as they admit, the booklet does not feature in any Kircher bibliographies, libraries or museums. The previous owners mentioned could not be found in ancestry records. The description sounds suspicious with enticing mentions that Kircher was onto something, and possibly PR related to a book. So far there are only two mentions of the booklet (in the auction itself and an article from 2nd June 2013), and only one image. No other publicity or marketing could be found. Update: That article now displays an “updated at” date of 11th January 2015, just after our discussion. Odd. Out of five Kircher items at the auction, three books sold and two booklets did not. I will mention the other unsold booklet, Arcanorum Theatro, because it has interesting similarities to the main booklet in question. Frontispiece of Arcanorum Theatro. Click on image for full size. 339. 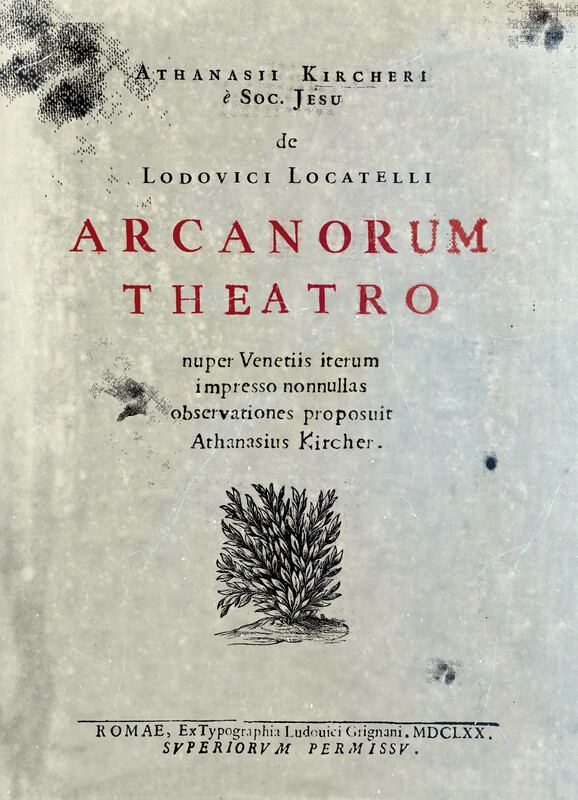 Kircher, Athanasius – Of Lodovico Locatelli once again impressed on some observations of mysterious Theatro in Venice recently proposed by Athanasius Kircher Rome, from the printing of Louis Grignani, 1670. In 8th. 30 pp. Frieze chalcographic the frontispiece, title page in red and black, three incisions in the text, light gora the first paper and small wormholes to the back plate of the binding, missing the final white, Full parchment coeval, with the back piece to the title in gold. Bookplates chalcographic Pauline Elson Bright (Boston). The first edition of the Handbook of alchemical Locatelli was engraved in 1644 by Giovanni Pietro Ramellati. In this rare dissertation Kircher, not present in any bibliography consulted and absent from the rich funds of alchemical-hermetic “Joost R. Ritman Library” in Amsterdam, the British Library and the Bodleian Library, the Jesuit takes but strangely examined only the second edition of the Handbook of Locatelli, printed in Venice in 1667 by Paolo Baglioni. It’s also very short (only 30 pages), could not be found in any libraries, and the previous owner doesn’t seem to appear in ancestry records. The similarity in style and image is uncanny. It even has exactly the same flaws/artifacts in the full digital image (here’s the link to Rich’s analysis of the original booklet again), and more. Photoshop guidelines previously embedded in the image file, showing up as soon as I opened it for the first time. Text suddenly going blurry in Arcanorum Theatro. The text suddenly goes blurry at the end of the word “Arcanorum”, why? Upper left corner of Arcanorum Theatro with cut-off area indicated. Click on image for full size. Zooming into the upper left corner, there is a weird rectangular area where the dots just cut off. How the clone stamp was used in the corner of Arcanorum Theatro. Viewing it at medium size makes the situation clear. The cut-off boundary aligns with the very upper-left corner. The shape of the stain was simply duplicated, and both copies overlap with each other. Appears to be a bad application of Photoshop’s clone stamp tool. 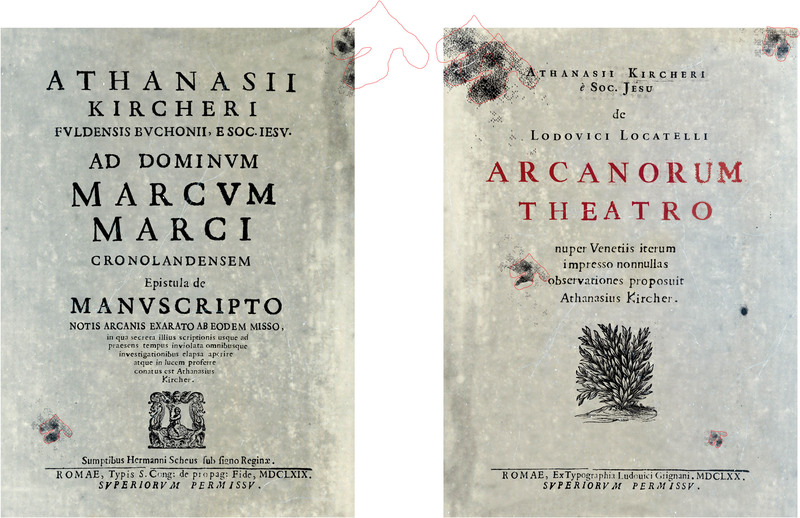 Identical bush emblem in Ars Magna Sciendi (left) and Arcanorum Theatro (right). Lastly, the bush emblem is perfectly identical to that in Ars Magna Sciendi, which is known to be real, and possibly La Chine Illustrée, if that indicates anything. Well if it’s a scam or PR stunt, it has a decidedly unsexy description. If it’s a joke, it’s not very funny. Whatever’s going on, I think it’s related to the main booklet in question. I talked to Ellie about this and we compared the two booklets. With all of that in mind, looking at both unsold Kircher booklets together reveals a very strong connection. Stains in the Kircher booklet with shapes outlined in red. Click on image for full size. It turns out that all of the stains in the booklets are the same shape, just resized and rotated. You may point out that the one on the left in Arconarum Theatro doesn’t fit, but looking closer, we can see why. Close up of stain in left of Arcanorum Theatro with shape (red) and cut-off boundaries (green) indicated. There are more boundaries where the dots cut off too cleanly. 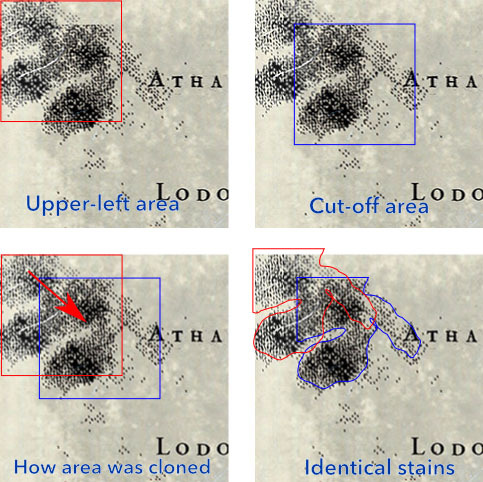 When they are traced out, we can see that the “stain” was originally in the same shape as the others, but parts were erased. Comparison of the footers of the Kircher booklets. Click on image for full size. Looking at the footers together, we can see that the horizontal lines (including the supposed printing flaws) are identical, only resized a bit. 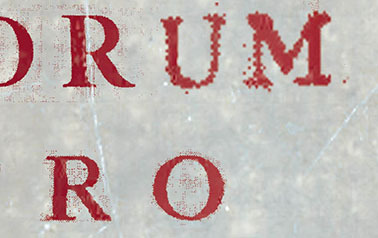 “ROMAE” and “SVPERIORVM PERMISSV” also look suspiciously similar. 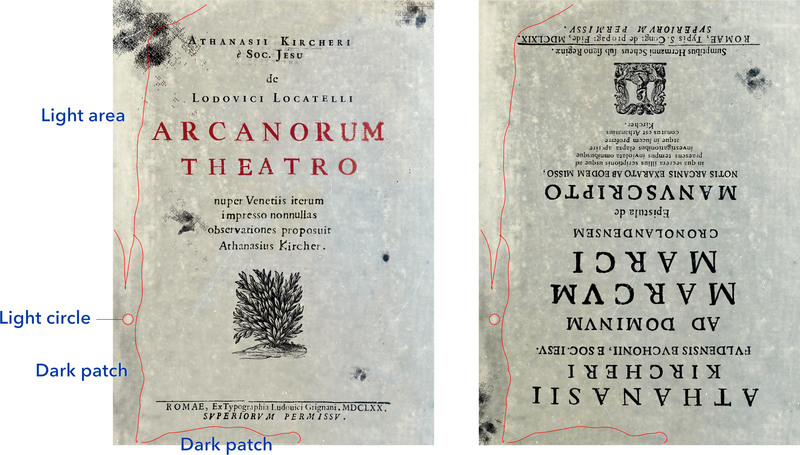 Comparison of the backgrounds of the Kircher booklets, with one flipped upside down. Click on image for full size. Last but not least, putting the booklets side-by-side makes it abundantly clear that the “paper” of both are exactly the same background image, but one was turned upside-down! Now you cannot unsee it! The only difference is that it has a light blue tinge on the right in Arcanorum Theatro. From my investigation and discussions, I think I can safely conclude that both booklets have always been modern digital forgeries. Yet I have also found that Minerva Auctions has a clean record. So who is behind it? The most likely scenario, according to David Jackson and I, is that the forgers produced physical items from their digital files and attempted to sell it through Minerva Auctions. The forgers submitted the original files (not knowing the JPG would retain the Photoshop guidelines) instead of taking photos of the items. Minerva Auctions got suspicious after consulting the experts and libraries, figured out the fraud and blacklisted the seller. However by then the items were already printed in the catalogues so they couldn’t just purge it from their records. So now they just say “this item was already sold, stop asking about it anymore please” to cover that they accepted and nearly sold forged items. However, the scenario does suppose a bizarre (and perhaps implausible) lack of competence on the part of both the forgers and the evaluators of Minerva Auctions. Also if Minerva Auctions discovered the fraud, it would have been far easier to just delete it from their website and say “sorry, the seller changed their mind and withdrew this item” at the auction. It is just a hypothesis so take it with a grain of salt and please don’t bother anyone about it!